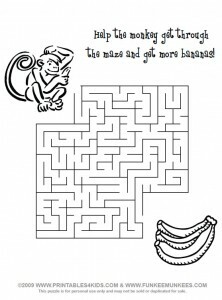 Go bananas with our printable monkey maze! Help the monkey make his way through the maze to get the bananas. Click image above to view and print the monkey maze full size or download the Go Bananas Monkey Maze as a PDF file. Get more fun monkey coloring pages and printable activities. I love this website! theres so much stuff in it!! The mazes are my favourite! © 2019 printables4kids.com - All rights reserved.